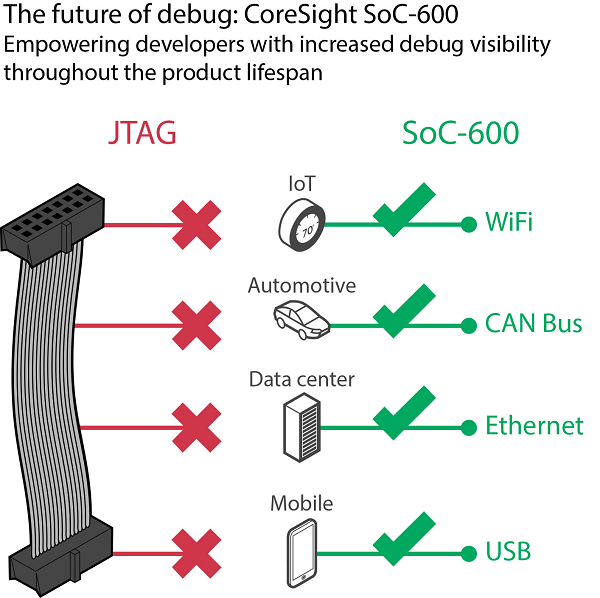 The culmination of decades of development in debug and trace IP - Arm CoreSight SoC-600 offers the most comprehensive library for the creation of debug and trace solutions. This includes debug access, trace routing and termination, cross-triggering and time stamping. Architectural changes simplify and standardise access into debug memory space, enabling protocol based debug access though existing functional interfaces. Reliance on a protocol that is agnostic of the physical link, ensures that solutions built around CoreSight SoC-600 are portable and scalable, avoiding the limitations associated with point solutions. New DAP architecture The new Debug Access Port (DAP) architecture introduces standard APB connectivity between Debug Port (DP) and Access Port (AP), making it possible to have multiple DPs connected to multiple APs.